Unfortunately, the management in most organizations today is based on implicit goals. Managers with a vague idea and understanding of their goals pass information on to their subordinates in a trimmed and distorted form. The subordinates then take these vague and trimmed goals and try to work them out for their subordinates. Therefore, after the information has gone through two or three management levels, it is nearly impossible to match the lower-level goals and their outcomes to the original upper-level goals. Also, while time passes, situations change and goals also change. Because of this, the discrepancies between goals grow larger and larger. Such non-transparent management is highly ineffective and could lead to unpredictable, unbelievable, and unrelated results. The links between the results and upper-level decisions are missed, and it takes a lot of effort and deep understanding of the situation to figure out what happened and why. Such a style of management is called “Management and Analysis Islands,” and it’s a big mess. Goal-oriented management offers an entirely different approach. In C2/GOMA goals are defined explicitly. Higher-level goals are detailed, broken down into subgoals, and propagated to executors. When goals are defined the information about their causes and effects, and the relations between higher and lower levels goals, is preserved. Achieved results are also linked to the goals and actions that led to those results. All of this information makes it possible to clearly see why certain decisions are made, how those decisions are executed by lower management levels, and how results relate to decisions at any level. In order for goal-oriented management to do this, one of the most important and needed C2/GOMA functions is the support of decision reason and consequence links in the information flows. This requirement is addressed by the 5th automation principle--the principle of Information Integrity. The principle of Information Integrity allows us to eliminate gaps in management and analytical information, and then link that information into continuous flows. Having an absence of information links between management decisions, between reasons and their consequences, makes management non-transparent and significantly complicates management in multi-level systems. The inability to clearly and easily link results to their original decisions breaks the feedback loop. It puts results analysis on the shoulders of human-managers and becomes a serious barrier to increasing the level of automation. Thankfully, the principle of Information Integrity takes care of this problem. Every management decision has reasons and consequences. Achieved results are linked to the decisions that led to their execution. Execution results are used in making new decisions, changing goals, or setting new objectives (feedback loop). Finally, goals in C2/GOMA have to be defined explicitly. The management automation system has to maintain all formal links between goals, and between goals and their results. Look for goals in a management system, even if they are set implicitly. Usually they are hidden under different names and abstractions such as projects, tasks, orders, actions, control signals, etc. Capture these goals in an explicit way by defining them with the 5W principle (who, what, where, when, why). Use the 5th element of the 5W principle--“why?”--to link goals with their super-goals. By doing that at all management levels, you will form the necessary reason-consequence links in the management information flows. In order to improve analysis it is good to have a history of management decisions, i.e. a history of goal changes/manipulations. This will help to relate goals to their original origins. Besides hard reason-consequence links in goals and information, there are soft links related to synergy, conflicts, or the competition for resources. It is important to differentiate between these two types. 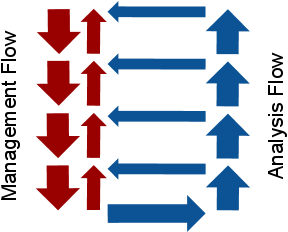 Hard links exist all the time, while soft links are temporary and depend on a current situation. When goals or situations change, soft links may also change, appear, or disappear, but hard links will stay no matter what. It is important, however, to record all links in order to keep the integrity of the information. Quite often, execution results are just dumped into a big database and used to generate reports. By looking at those reports, a human has to recall a situation in the past and then mentally link the results to goals set at that time. Obviously, such an approach has a lot of issues and becomes a serious barrier toward further automation. Because of that, when implementing a new C2/GOMA system, you have to maintain formal links between results and their original decisions, goals, and the actions that led to them. Goals are uniquely identified in a system. When a new goal is formed, higher-level goal identifiers--tags--are stored with it. When results are produced, identifiers of the goals that caused the execution are taken and stored together with the results data. Stored goal identifiers are then used to aggregate the results (SUM, MIN, MAX, AVERAGE) and link them to goals at any management level. If the management automation system has a common goal repository, which allows it to quickly and easily restore the entire goal chain using reason-consequence links, it is possible to use a truncated goal vector which contains only the identifiers of the lowest-level goals. Otherwise, when goals are spread across multiple components and it is not possible to quickly restore the chain of goals, a complete goal vector shall be stored with the identifiers of all sub- and super-goals, i.e. the entire chain of goals. Finally, it is also important to mention escalations. Having an escalation is a notification that a set goal could not be achieved as defined or expected. Consequently, escalations, like results, have to be linked to their corresponding goals. By using only explicit goals and keeping information whole and complete--by using the principle of Information Integrity--all the decisions and related results of a management system can be easily seen and understood. The principle of Organization Wholeness says that the elements in a system are interdependent and collaborate with each other. But it doesn’t say how exactly they collaborate. 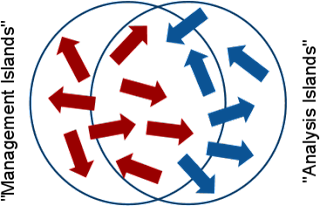 In this post I will discuss the 4th automation principle, which states that the collaborations of elements are not chaotic, but follow a specific law--Goal-Orientation. We already know that an organization is a goal-oriented system. It has goals with elements that collaborate in order to contribute to those goals. Detailed at the upper management levels, organizational goals are broken down into smaller and more concrete sub-goals, and are then propagated to the levels below. The same process then happens again until all goals reach an elementary level and are set to an immediate executor. After that the elementary goals are executed and produce specific results. When these elementary goals are completed, they are composed together and attributed to higher-level goals. Achievement of the higher-level goals then leads to reaching their super-goals and so on. In this way, reaching the overall organizational goals is based on the cummulative effect of reaching elementary goals at the lowest management levels. Because of this, the biggest objective of upper management levels is to optimally break down goals into subgoals, propagate them to lower levels, track the execution process, and make necessary corrections. In addition to goals there are many other information flows that circulate in an organization--observations, interpretations, escalations, results. But all that information doesn’t have a value on its own. It is required by the goal reaching process and has to be considered in the context of related goals. The principle of goal-orientation, as well as the other principles, stands against the gaps in automation. Specifically, though, it targets the gaps in collaboration and alignment between elements and management levels. Most collaborations in a management system are goal-oriented. In other words, they are targeted towards reaching specific organizational goals. Upper-level goals are broken down into subgoals, and are then propagated through management levels until they become elementary and can be executed. Elementary goals come to executors and are finally acted upon. The execution results are then observed by the upper management levels, composed together, and used to reach higher-level goals. Hierarchical management - goals are propagated strictly from upper to lower management levels. Network management - goals can be propagated horizontally at the same management level. Not every organizational structure supports efficient goal-reaching. A specific structure must be chosen and developed to effectively address the goals of an organization. 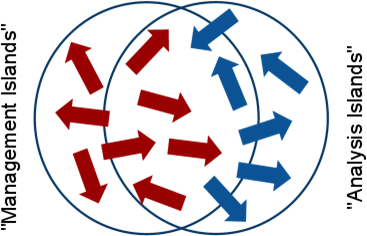 Individual groups and divisions in an organization, besides working toward the overall organizational goals, sometimes have their own local goals. Typically, those local goals exist to maintain the integrity of the group (so-called “internal heat”), but they can bring about extra and unneeded work. Therefore, if a group can be replaced by one super element, which can produce the same overall results, the super element should be implemented. It will bring the effort and resources spent on local and unneeded goals to zero. Management that is based on implicit goals has a lot of chaos. It breaks the goal-orientation principle by having goals, actions, and information flows that are not detailed and linked to the overall organizational goals. In order to eliminate this chaos, make explicit goals that are related to the overall aim of the organization. System Manageability is defined as the ability to control actions at lower management levels from higher management levels. When higher-level goals are detailed and propagated to executioners quickly and effectively--leading to desirable results--there will be less chaos in decision making and system manageability will be higher. Management Transparency is defined as the ability to clearly see execution results at any upper management level and the ability to relate those results to set goals. This allows an organization to make necessary corrections and reach goals faster, better, and with less effort. With goal-orientation and open communication, it is easy to reach high levels of transparency. By keeping an organization goal-oriented, every element of the organization will easily collaborate and communicate with each other. When creating a new management automation system, the most common question that developers have is, “What will it do at the end?” It is quite hard to answer such a concise question with a similarly concise response. After all, management automation is a relatively complex thing. However, my research partner and I tried to outline the overall direction and give a few tips regarding what should be included into a conceptually complete C2/GOMA system. The next principle, Functional Completeness, talks about that. Any conceptually complete C2/GOMA system must automate at least 1 OODA Loop. Otherwise, it is considered incomplete. 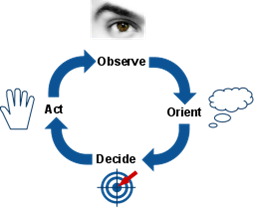 Sensing - extracts, validates, and consolidates situational information. Analysis - interprets information, compares current situation to expectations, finds mismatches and their causes, and provides facts for planning or replanning. Planning - formulates action plans to achieve upper-level management goals. Execution - performs the generation and transmission of control signals to execution origins, following set action plans and tailoring them to the current situation. 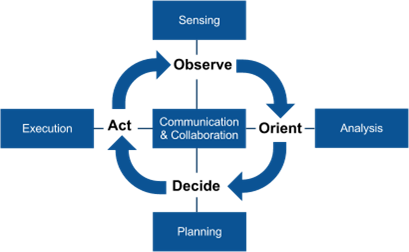 The 5th functional group, Communication & Collaboration, integrates the management functions of the OODA Loop with each other (Continuous Management) and connects the entire subsystem to the rest of organization (Organization Wholeness principle). If there are functional groups absent in the management automation system, they must be covered by someone or something else. One way or another, the management cycle must be complete, otherwise it will be dysfunctional. The integration of multiple complementary subsystems can achieve this completeness. Also, if some functions of the cycle are not automated, those holes can be filled by humans. The decision on automation completeness (coverage) should be done consciously, after an analysis of all possible consequences. Make sure that information is available to the management automation cycle by using public interfaces. Quite often, decisions regarding the implementation of public interfaces are done only after the implementation of a system of core logic, or are not done at all. This leads to the development of an isolated, self-contained system. Information that is available and could help in work doesn’t come into the management cycle and functions become complicated or unneeded. It is better to design a management automation system as a component, starting from its public interface (from the Communication & Collaboration function group). The public interface will cover all incoming and outcoming information flows. Then, once the public interface is implemented and information is free and available to the cycle, move on to design the management functions of the remaining function groups. By integrating the functional groups of Sensing, Analysis, Planning, Execution, and Communication & Collaboration into your management automation system, you can have Functional Completeness. The principle of Continuous Management looks at any activity in any level of an organization as an OODA Loop management process. This approach presents a universal model to look at the management performed by a single person, a group of people, or an autonomous system. Also, because of the OODA Loop approach, the transition from manual to automated processes and visa versa is made easy, without drastic changes to the way management is being done. These facts are very useful in the development of management automation systems. Similar to other principles, the principle of Continuous Management stands against the gaps in automation. In this case, it is concerned about the gaps in local management areas caused either by an absence of required information flows or management functions, or their poor integration. To address these gaps, the OODA Loop can be used as a model where information flows coming into a system are processed and transformed continuously by management functions through 4 distinct states: Observe, Orient, Decide and Act. Also, because of the OODA Loop, information flows and management functions can all be active at the same time. Management is a continuous process. Situational information is captured and interpreted, action plans are defined through higher-level goals, and actions are executed that lead to situation changes. Then, the changes in the situation are observed and interpreted, goals and plans are changed, and new actions are executed. By doing this, the management cycle repeats itself again and again, and, in that cycle, all information flows are interconnected. Management is an information process. Situational information, interpretations, goals, and plans are all information flows. They are produced and/or consumed by a management automation system. Even actions, which cause physical effects in the outside world, can be defined as information about work done and its related changes. Management has a broad meaning. Management in C2/GOMA is not considered as an activity performed exclusively by professionals with a “Manager” title. It understands any type of goal-driven activity as being a type of management. Any work, even the most simple function, can be viewed as the management of particular piece of equipment or one’s own body. Moreover, C2/GOMA management is not limited to the activities performed by only humans, but also by automation systems, Artificial Intelligence, robots, microcontrollers, and so on. 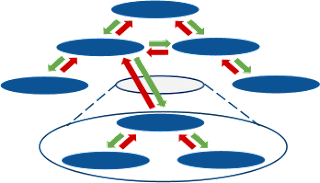 Management can be described with the OODA Loop. In essence, what is management? It is a procedure that processes information and leads to related actions. Before taking action, newly observed information has to be interpreted and turned into decisions about what actions to take and when. Management has to Observe, Orient, Decide, and Act. Finally, now that we see how Continuous Management is defined, how do we apply it? Use a common approach to management automation problems. In its essence, the management process does not depend on who manages (an individual, a group, or an automation system) nor on what is being managed (an entire organization, a department, a dozer, or just pair of hands with a shovel). Apply the same approach throughout the system. Define what situation information is captured and who/what produces that information. Define how information is interpreted, what facts are used for decision making, and how those facts are chosen. Define how action plans are formulated. Last, define what actions are taken, what effects are observed, and what will drive new decisions. Classify components by states in OODA Loop. 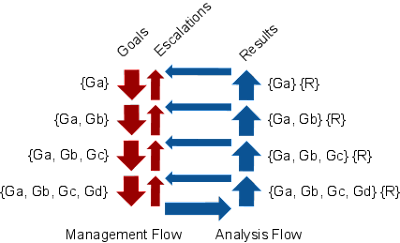 Classify information flows and link them together into cause and effect chains. Create an OODA Loop model for the real system. Compare the real (required) model to the current (developed) one. Define what management functions are absent and which ones are excessive. Define what information flows are absent or excessive. Finally, analyze the external dependencies and compare them to public interfaces. Improve the flexibility and reusability of automation solutions by implementing and utilizing generic management procedures. Stop doing disruptive, gappy management automation using isolated sequential functions. Even though the simple, single-function machine is well understood and proven, the alternative is not much more complex, and it is much more powerful. Try to implement a management system that uses functions for all 4 states of the OODA Loop and close the management cycle. By doing this, the principle of Continuous Management will help us create complete management automation systems.